The Terriers fall short to the Manhattan College Jaspers 1-0 in double-overtime in their home opener. It was a tough loss but the Terriers played a great game and should be proud of their efforts. 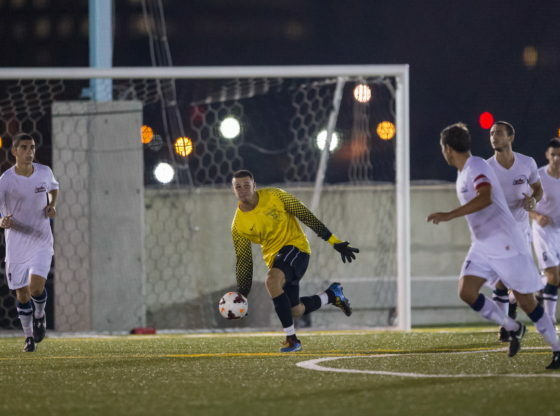 After failing to secure a victory in the season opener against the likes of St. Joseph’s University on the road, the St. Francis Terriers men’s soccer team has endured an identical result in their home opener at Pier 5 of the Brooklyn Bridge Park, losing a heartbreaking 1-0 match to the Manhattan Jaspers in double overtime. This game surpassed the standard game time of 90 minutes, needing two extra 5-minute sessions in which the Jaspers were able to force an own goal score due to the relentless pressure they displayed during tonight’s affair. In the 103 minute, seniors forward Tommy Amos and mid-fielder Jake Scavetta combined to lead the series of events which resulted in the Terriers downfall as Amos kicked a ball through the box which connected off Scavetta, a couple of Terriers and into their own goal. It was a domino effect. This was definitely a tough loss for the Terriers as they provided a convincing defensive effort in front of their faithful fans keeping the Jaspers off the board for a total of 104 minutes. However, the story of the game lies within the numbers. The Terriers attempted 21 total shots in which 16 were off target, five were on target and five were saved by the goalie. The Jaspers, on the other hand only attempted eight shots in which three were off target, five were on target and four were saved by the goalie. In addition to the eye-test as well as reviewing the numbers, the Terriers have an aggressive offensive capable of controlling the time of possession in a game.The main objective is to convert on the chances they provide themselves with. This is the second straight match where the Terriers have failed to score and although the season is in its infant stages, a goal will definitely ease some of the pressure on the Terriers giving them the confidence they need to put a complete game together, combining their defensive prowess with their offense. The remains of the 2013 NEC Championship team have moved on to other endeavors, most notably Kevin Correa, and this season’s success lies on the shoulders of this current blend of athletes with experience and limited experience. The Terriers will look to add their first victory of the season on the road against the University of Massachusetts, this Friday September 5.